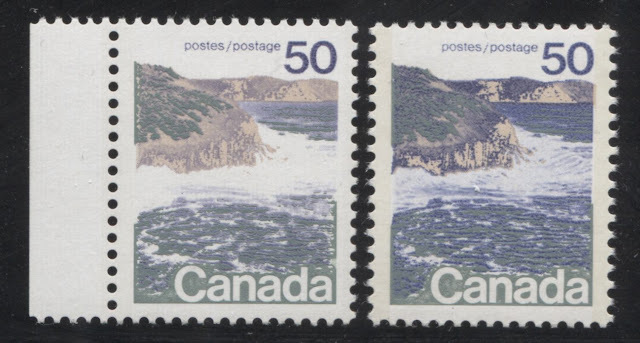 This week I examine the last two physical characteristics of these stamps before I get into the most significant topic of this issue, which of course is the paper varieties. The two characteristics that I discuss this week are the gum found on the stamps, as well as the chalk-surfacing found on the mid values and BABN printings of the $1. 1. The intensity of the tagging, as it appears under normal light, and 2. The different methods that were used to apply the tagging to the stamps. Here this block shows selvage at the sides that is fully perforated through, while that at the top and bottom of the sheet shows only a single extension hole. This suggests that the panes were laid out horizontally in the print run. This week's detailed post about this issue explores a topic that has surprisingly received little to no attention in even the most specialized catalogues: the shade varieties. It is surprising because all but two of the stamps in this series exhibit at least two and up to 4 or 5 different subtle variations in the shades of the inks that were used to print the stamps. What makes the shade variations especially interesting to me, is the fact that many are associated only with certain printings, and certain time periods within the life of the issue, and consequently, it does not appear that they are merely just random varieties that have no significance. 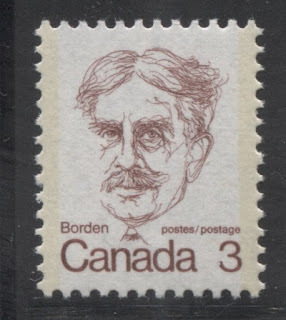 This week, I wanted to do a short post about the varieties found on the low value stamps. 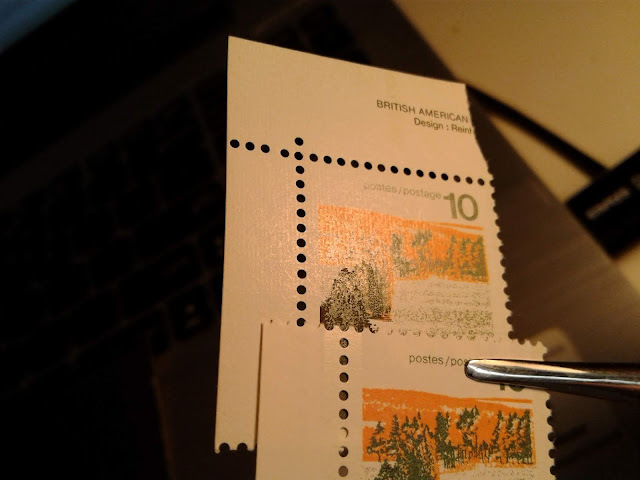 Although Unitrade does list a few constant varieties on the 8c Queen, and a few varieties on the booklet stamps, most of the flyspeck varieties that can be found are not listed. 1. Hairlines that run vertically through the design. These usually run all the way through the design from top to bottom and one stamp can often have several. 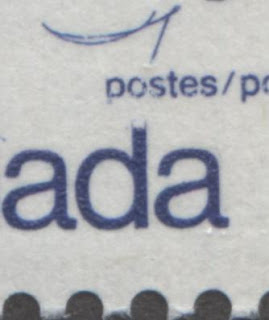 I have found them on the 2c and 6c most often, but I suspect that they exist on all the stamps. 2. Stray dots and smudged blobs that appear either in the background, or on or around the portrait. These are what pretty well all the listed varieties are. 1. The type differences listed in Unitrade. 2. The constant varieties listed in Unitrade and other varieties that can be found. This week's post, my first of the New Year, is the last one that will deal with commemorative issues for a while, as next week I will begin my foray into the complicated 1972-78 Caricature Issue, which I expect will be a very popular series with my readers. This post deals with just three issues: the Earth Sciences Issue, the Christmas Issue and the Cornelius Krieghoff Issue. 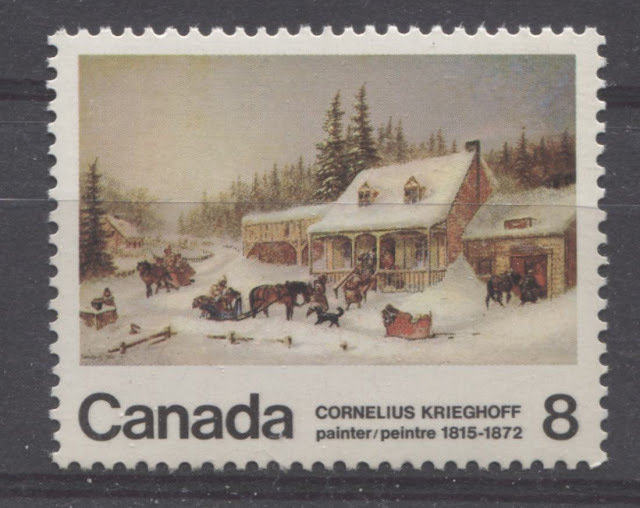 Collectors will already be familiar with the fact that there is the Ottawa and Winnipeg tagging on the Christmas issue, and the five constant varieties on the Krieghoff issue. However, as the detailed post on my website illustrates, these three issues are much more complicated than you Unitrade would lead you to believe.